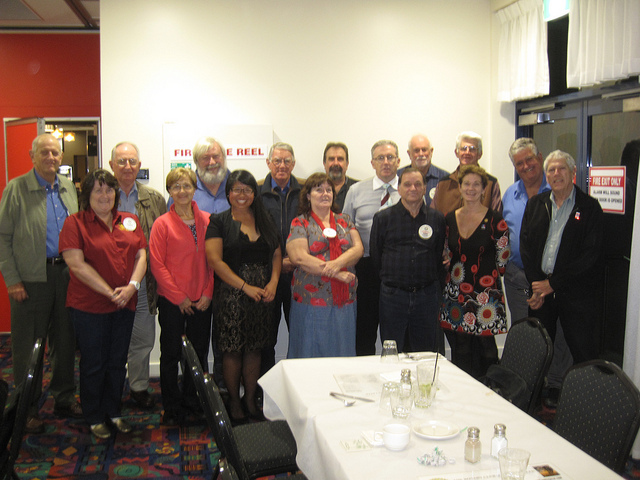 Tonight, I spoke at the Rotary Club of Albany Creek! They meet on Tuesdays at 6pm for a 6:30pm start at the Aspley Hornets Club, established in 1964 that caters to football programs from age 6 with Auskick to Super-Rules for over 35 year olds as well as being a restaurant, sports bar, and bottle shop. The club meets in one of the function rooms for some privacy because it is a really popular and lively establishment. Rotarian Peter arranged everything for my Albany Creek visit but was unfortunately away on holiday so I didn’t get to thank him in person so I will thank him here virtually. At Albany Creek, the Chairman runs the meeting which was fun for me to experience as most clubs I visit, the President does. Tonight, the Chairman was Nigel and he kept the meeting moving along smoothly. He was so kind to provide me a lift from his work to the meeting. We found out that we both have eclectic tastes in music from classical to rap. He has worked for the Mater Foundation for 18 years and is currently doing a project with Vanderbilt Hospital which is located in Nashville, TN. What a small world in which we live. During their meeting, a member presents his or her ‘Rotary Moment’ which tonight, highlighted the need to attract younger members. The Rotarian wanted the club to strive to be more relevant and focus on community projects that the potential members could tangibly be part of. Some of the members had attended the Rotary International Convention in Sydney and came away with a renewed sense of motivation and inspiration for their club projects. We all agreed that keynote speakers Tommy Spaulding and Maya Ajmera, who are former Rotary Ambassadorial Scholars, were quite impressive. Their stories really touched me knowing how their passion for leadership and reaching marginalized children has changed the world for the better. The club is also involved with Interact and reported 29 clubs in the area which is an increase from the last report. They value the future generations and want to help them develop a sense of community, leadership, and service. After my presentation, the members were curious if I had thought kangaroos were hopping around the streets before coming to Australia. Funny thing is, after the meeting, we were driving down a neighborhood street and guess what we saw, a hopping wallaby! We had a great laugh about that. A few members were heading to the States soon to do Route 66 and asked me for advice. I explained the tipping protocol which is a really big difference between our cultures. In Australia, it is not customary to tip. The price you see if the price you pay. In America, when eating at restaurants or going to bars, it is typical to tip 15%-20%. They also wanted to check if I knew what State of Origin was as well! I told them that I definitely bleed maroon. Many Rotarians connect with Nashville’s country music but I feel so privileged to broaden their horizons about the many other aspects of Tennessee culture they may not be aware of such as hot chicken, growing multi-cultural population, and the presence of the Consulate-General of Japan. We swapped banners and to close the meeting, the club sang the Australian national anthem! I really loved this because each time I visit a club, I learn about a particular tradition that the club upholds. 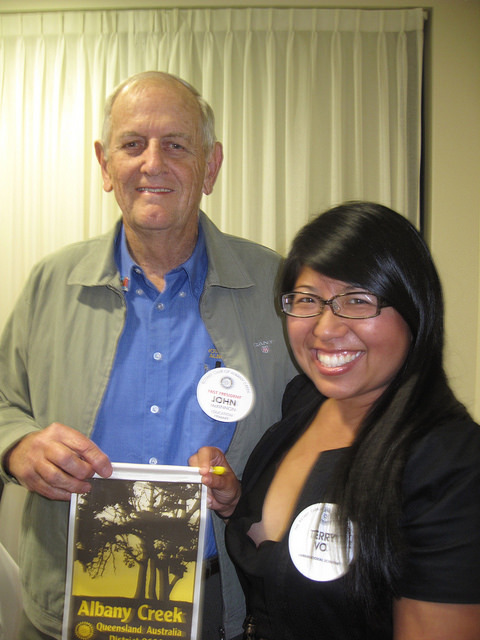 Each club has a personality and is unique which reveals how fun and diverse Rotary is. The clubs are all different and finding the one that fits your needs is very important. Rotarians, Rob and Judy are always first to raise their hands to take home a visiting Rotary Foundation participant (Ambassadorial Scholar, Peace Fellow, etc.). No matter where we live, they are more than willing to take us home and this is just one small example of how Rotarians put others before themselves. I am so appreciative of them and the entire Rotary community.